This new study is from the Yale researchers who have brought us much of the scientific literature on rear-end impacts, and they focus their expertise on side impacts in this report. Their goal was to quantify the risks of side impact collisions and compare them to frontal and rear-end crashes. The authors subjected six human cadaver spines to side impact forces of 3.5, 5, 6.5, and 8g. These are forces that we would expect to see during low speed crashes of less than 8 mph. The normal anatomical motion of the individual vertebral segments was carefully measured before testing, and the injury motion was recorded during the side impact tests. The movement of the spine was analyzed after the tests to determine the motion of each vertebral segment. The study determined <em>Injury Potential</em> for each joint, which was the increase in mobility of the joint after the test. For instance, an <em>Injury Potential</em> of 100% means that the joint experienced twice the mobility after the test impact, indicating a severe stretching of the spinal ligaments. <br clear="all" />The C6-C7 segment showed a 25% increase in joint laxity at the small 3.5g acceleration. The Injury Potential rises rapidly to the 8g acceleration, where it reaches 107%. The researchers found that at the 6.5g impact, injuries occurred from C4-C5 through C7-T1. The 8g impact found even more severe injuries to the joints in the same spinal segments, indicating that, as in rear-end impacts, the brunt of the trauma is found in the lower cervical spine. Why is this? 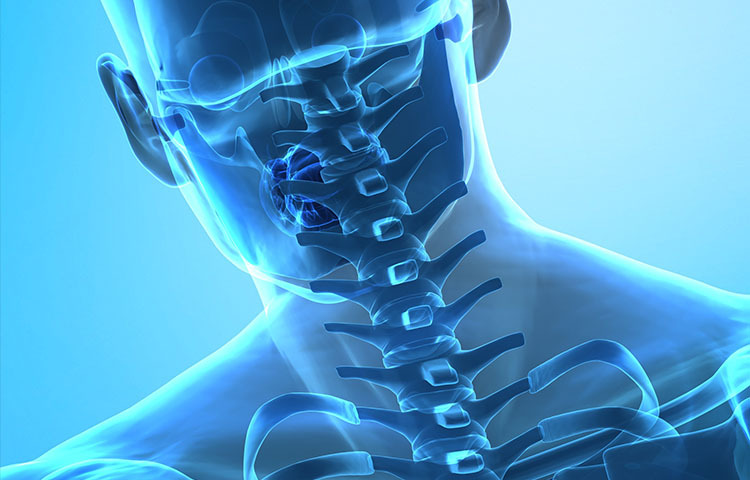 The vertebral segments below C7 have a more limited range of motion than those in the neck. When the torso is accelerated with the car seat, it tends to move more as a whole unit. This creates a tremendous amount of strain on those segments directly above T1—the exact area this study (and many others) have found to be the most likely to be injured. This study shows that the ligaments of the cervical spine can be stretched beyond their physiological range of motion after a low speed, side impact automobile collision. When patients have been exposed to this type of crash, it is important to obtain lateral flexion x-rays, which can help identify the injured spinal segments. Excessive laxity in the joints may indicate permanent disability in some patients. Maak TG, Ivancic PC, Tominaga Y, Panjabi MM. Side impact causes multiplanar cervical spine injuries. The Journal of Trauma: Injury, Infection, and Critical Care 2007;63:1296-1307.